This show represents two Balinese painters who stand for different generations. They have applied Balinese traditional painting as the basis of developing their work and therefore they have a similar technique in their exploration. Teja is a young painter from Sanur who has developed his work, underlain by the Balinese Wayang character, since 1990. He has succeeded in creating his own distinctive style. 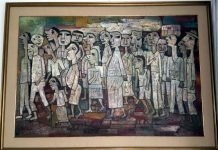 On the other hand we have the late lamented Dewa Putu Mokoh who learned the Pengosekan style of painting at a young age; thence he was able to break away and developed his own distinct character of painting. 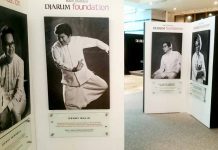 A creative exploration of the similarities between the two men who represent two different generations can be interpreted as a different style to the development of contemporary art in Indonesia. Their presence has marked thread of Balinese painting styles in the development of contemporary art. Namely the development of painting that explores the contemporary aesthetic exploration, yet still showing a thread of earlier Balinese paintings. In other words, the presence of their works marked the development of painting in contemporary Balinese who have an identity.